Is it Possible to Clear JEE without Coaching? Is it possible to Qualify JEE without Coaching? This question crops up in the mind of every second engineering aspirant. A Majority of the engineering aspirants end up enrolling in coaching classes. However, joining the coaching classes for JEE preparation is not a viable option for every engineering aspirant as the coaching institutes charge enormous fees. The humongous fees and rigorous schedules of the coaching Institutes places the aspirants in a state of dilemma of whether joining a coaching Institute is really worth it. This article will cast light on the emerging trends in JEE preparation and will also list down the Tips to Qualify JEE without coaching. It is clearly evident that more than 50% of the JEE Advanced 2016 Qualifiers had preferred self-studies in comparison to Coaching classes. Is it Possible to Crack JEE without Coaching? Let us first delve into the pros and cons of the dilemma. 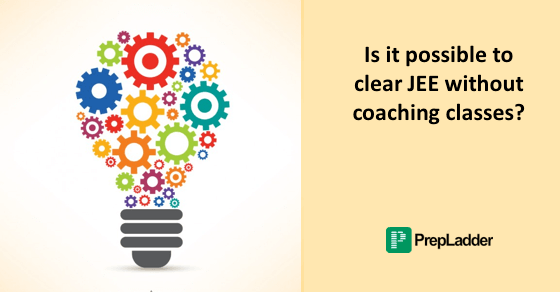 Coaching Institutes offer a systematic framework for JEE preparation. They offer expert guidance, helps in learning Tips and Tricks, Helps to learn Time Management and offer regular assessments. How to Crack JEE without Coaching Classes? Here is a list of the pre-requisites through which you can crack the JEE without Coaching. It is of utmost importance to refer to the right study material for JEE preparation. Study the NCERT books of Class 11 and 12 very thoroughly. Besides that, prepare from one or two good quality reference books. You first need to chalk out a weekly study schedule each week and must try to follow it religiously. Try to complete the topics as per the schedule since this would gradually help you to complete the syllabus well in time. As everyone is aware of, questions in the JEE exam are purely conceptual. Therefore, you must focus on clearing your basic concepts with priority. Do not follow learn-by-heart method. You must try to comprehend what you are studying and should not merely rely on rote learning. Owing to the extensive syllabus of JEE, you must aim at preparing the most important and high yielding topics on priority. Prepare the Most-Important Topics from all the three subjects in the beginning stages and advance to the less important topics in the later stages. It is of utmost importance to practice MCQs consistently through the preparation. Prepare a topic/chapter and simultaneously practice MCQs on that topic. This will instantly help you to understand the application of concepts. Practice a large number of questions on each topic to attain a grip over each topic. Monitoring your performance consistently is vital to attaining success in JEE. Consistently attempt a large number of chapter-wise, subject-wise and full-length online mock tests to enhance your overall performance. Check your performance after each attempt and figure out your weaknesses. Work on your weak areas and try to improve your Accuracy with each attempt. Time Management is vital to success in JEE. Effective Time management is an art which can only be learnt through attempting a large number of mock tests. With each subsequent attempt, try to reduce the time spent per question and overall time spent in attempting the exam. You must solve at least 7-9 previous year papers of JEE. This would help you gauge the difficulty level of questions and the type of questions expected in the exam. Further, there are chances of questions being repeated from the previous years’ papers. Therefore, never miss on solving previous year papers. We are sure that you can surely clear JEE 2017 without Coaching by Implementing the Aforesaid tips.